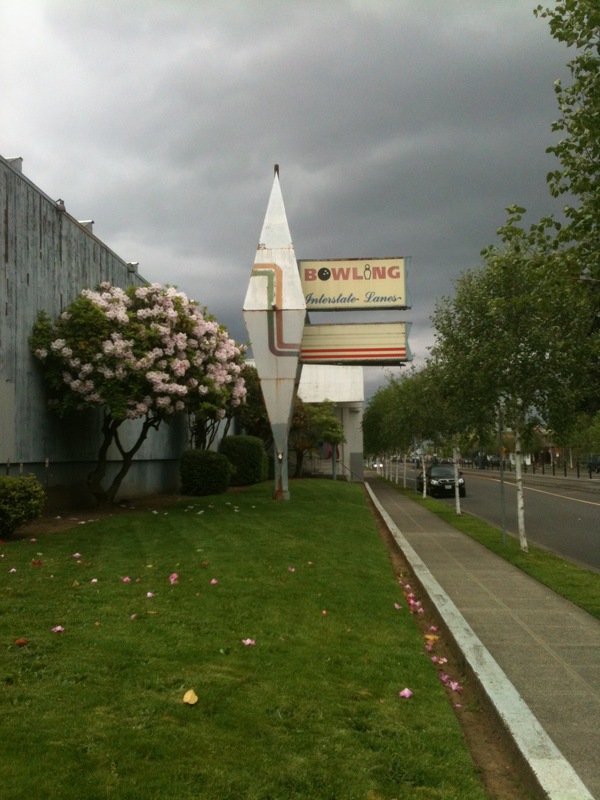 The center of every neighborhood should revolve around a bowling alley. It’s a place where people meet, chat, catch up and then throw heavy balls at wooden pins and listen to the sound they make as they hit the polished floor that adds spin to the bowling balls that are hurled down the long alley towards the pins. The cycle would repeat itself until the bowling alley was closed for the night and everyone would go home to get ready for the next day’s work and the following evening’s bowling and visiting with neighbors. But bowling is not such a neighborly activity anymore. It may be a dying sport. I’ve yet to read the book Bowling Alone. It’s an older book that, as I recall, summed up the underlying story of what’s going with humanity and bowling. The Kenton neighborhood used to have a bowling alley that now houses the Disjecta Arts Center. We lost our lanes when they moved up the street to new digs and became Interstate Lanes. I’ve long admired the simple yet cosmically inspired, with a slight psychedelic twist, external decoration that can be seen in a mural on the building, the sign post, entryway paint job and strips of neon. Sure the paint may be peeling off the outside walls and I’ve heard a rumor that the bowling alley may close but I’m hopeful it will stay open if only because there are now too few places to bowl left in the area. 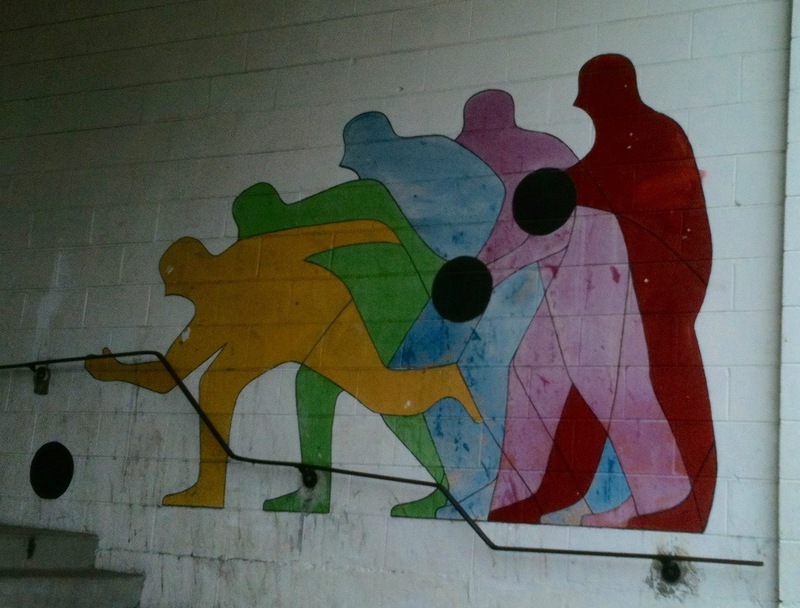 The entry way has a multicolored picture of what looks like the evolutionary stages of upright bowling. It could also be seen as group of bowlers who like to bowl together–especially close. The sign post does it right. Somehow a conglomeration of metal stripes and shields supports a sign that creates a visual pun by replacing letters with bowling equipment. Regardless of how aged it looks, it all seems so classy, clever and cool. The coup de grace, pardon my French, is the giant mural on the side of the bowling alley that hasn’t totally succumbed to vandals. It’s where things get cosmic. I see intergalactic bowling in space. This occurred to me because the round object at the lower edge of the picture looks like a planet. I image Aliens being the ones to keep the sport of bowling popular. This would probably be because they would enjoy smoking and drinking PBR which seems as much a part of the game as the game itself. The mural is a thing of beauty with a slight marring from an errant spray can nozzle. 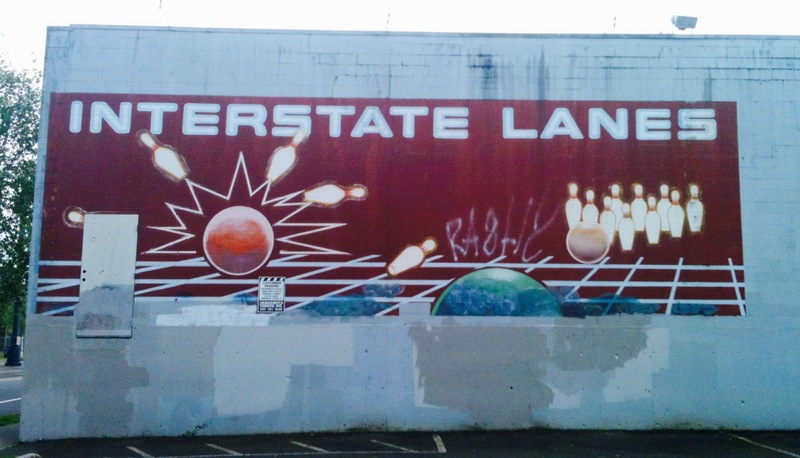 I can only suggest a double dose of cosmic bowling which would entail staring at the mural and then actually doing some actual cosmic bowling resulting in more of a trip than just going to Interstate Lanes.